The history of the Blades stretches back many centuries, to the Akaviri Dragonguard. They relentlessly hunted dragons in Akavir, and in 1E 2703 they invaded Tamriel to continue this crusade. They marched through Morrowind and Skyrim with little resistance until being met by the united forces of Cyrodiil under Reman I at Pale Pass, in the Jerall Mountains. As soon as they heard Reman's voice at Pale Pass, they knelt before him and proclaimed him Dragonborn, claiming he was what they had come to seek. These new additions to his army did much to enable Reman's conquest and unification of most of Tamriel to found the Second Empire. However, the Dragonguard had not forgotten their original mission, and they continued hunting dragons, particularly in Skyrim, with great success. Dragons were driven nearly to extinction in the next two centuries, and the Dragonguard operated chapters across Tamriel under the direct command of the Dragonborn emperors. Unfortunately, as the Dragonguard had not yet evolved into the espionage specialists that were the Blades, they failed to prevent Emperor Reman III's assassination by the Morag Tong in 1E 2920. The Dragonguard was officially disbanded after this ignominious event, with many members becoming mercenaries and later forming the Fighters Guild. Others went on to ensure the martial and mystical arts of old Akavir would survive into Second Era, and became known as Dragon Knights. Unofficially, some were retained by the Akaviri Potentates, now as a covert force rather than an honor guard. Others continued hunting the wary surviving dragons in Skyrim until at least 2E 373. Later, during the long Interregnum, in the absence of any true emperor to protect, they protected his Ruby Throne in the Imperial City from the petty warlords rampant in Cyrodiil. Some would-be emperors formed their own personal 'Dragonguard', although these were only imitations of the Akaviri, not a continuation. It is speculated that the real Dragonguard may have sought out and protected potential Dragonborn, including the future Tiber Septim, in a bid to place one on the throne. With the ascendance of a new Dragonborn emperor, Tiber Septim, the ancient order emerged from its seclusion and resumed its role serving the new empire. It was under the Septim Dynasty that the organization became known as 'the Blades', as they rose to a greater prominence than the Dragonguard ever had, developing into a continent-spanning intelligence service that worked under the personal direction of the emperor. This network was necessary to accomplish the vital tasks with which the Blades were entrusted, including the recovery of the shattered pieces of Numidium, which took centuries to accomplish and resulted in the Warp in the West. Emperor Uriel Septim VII in particular made heavy use of the Blades, dispatching agents to investigate King Lysandus's death and the Nerevarine prophecies. At some time in the Third Era, with dragons popularly regarded as extinct, the Blades further distanced themselves from their Dragonguard origins and embraced a semi-religious devotion to the Divine Talos, becoming closely associated with the monastic Order of Talos. Their faith was sorely tested, however, when Uriel Septim VII was assassinated by the Mythic Dawn, along with all his known heirs, setting off the Oblivion Crisis. Fortunately, the Blades were entrusted with the knowledge of an illegitimate son, Martin Septim, who shared the Dragon Blood of his father. With the help of a nameless Champion, the Blades were able to safeguard Martin until he could summon an avatar of Akatosh and banish the Daedric Prince of Destruction Mehrunes Dagon from Nirn, at the cost of his life. With the Septim Dynasty sundered, the Blades once again secluded themselves in their temples to await the coming of another worthy Dragonborn. Eventually, Titus Mede was declared Emperor, beginning a new dynasty, but he was no Dragonborn and so the Blades did not truly serve him. Rather, they foresaw the threat posed to the Empire by the Thalmor of the Aldmeri Dominion, and worked covertly to combat them for years. Without support, however, these efforts could not last forever, and in 4E 171, an Aldmeri ambassador delivered to Titus Mede II the severed head of every Blades agent in Summerset and Valenwood, sparking the Great War. During the war, Cloud Ruler Temple was besieged and its centuries-old archives mostly destroyed. When the war was finally ended with the White-Gold Concordat, the Blades were formally disbanded and worship of Talos outlawed. The Thalmor were thus given free reign to hunt down Blades agents wherever they were found, and the order was almost entirely wiped out by 4E 200. 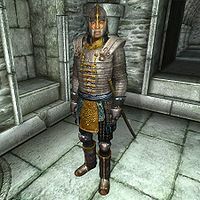 Their role as Imperial bodyguards and spies was taken over by the new-founded Penitus Oculatus, who were too constrained by Imperial policy and diplomacy to take the kind of offensive action against the Thalmor the Blades had taken before the Great War. When dragons began reappearing in Skyrim in 4E 201, a few surviving Blades took action, working with the Last Dragonborn to bring the order back from extinction. Under acting Grandmaster Delphine, Sky Haven Temple was reopened and new Blades were recruited to aid the Dragonborn. Ancient dragonlore was discovered that proved to be the key in the defeat of Alduin the World-Eater, and the imminent threat was ended. However, some dragons still remained, and so the Blades continue the ancient Dragonguard's task. While a few elite warriors and diplomats served openly in royal courts, the majority of Blades agents were distributed across Tamriel to conduct their covert business. The only people who knew all the activities of the organization were the Grandmaster, the supreme leader of the Blades, and the Chronicler, who was tasked with knowing, but never revealing, to ensure the Blades' knowledge would never be lost. Each regional temple was led by a Master, and staffed with Archivists who maintained the lore of the order, with works in the archives stretching back to the days of the Dragonguard. Field agents were supervised by Spymasters assigned to each province of the Empire, and lived incognito among the citizens to perform their work. 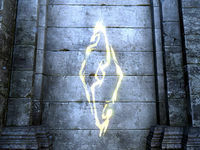 For game-specific information, see the Arena, Morrowind, Oblivion, Skyrim, ESO, and Legends articles.